Located across from the Brigade Sports Complex, next to the Naval Academy Golf Course, the Club at Greenbury Point offers a welcoming atmosphere with handsomely appointed rooms in rich mahogany wood accents. 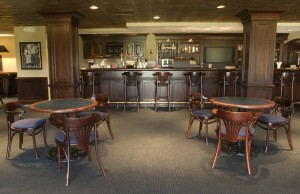 As part of the Naval Academy Club, membership is required to use The Club at Greenbury Point. Amenities include a full bar, large screen televisions, game tables and shuffle board. Join us for a refreshment after your golf game or host your next event with us in our spacious main room. 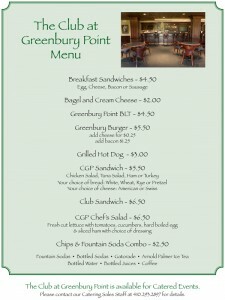 The Club at Greenbury Point is a more casual dining option available to our members. We serve a light fare and snacks every day and host Happy Hour from 3:00 p.m. – 7:00 p.m. every Friday. You’ll enjoy $1 off all drinks, and $4.00 off pitchers, and complimentary hors d’oeuvres. beverage cart will be cancelled. We are also available for private events!